From the moment we decided we were moving to the south, "Fall Apple Picking" has been on my must-do list. While I still want to do it, our friendly CSA has been providing us with so many local Alabama apples that I wouldn't even know what to do with more right now. We've been getting a full peck (yes, that's an actual measurement!) each week for the past few weeks. 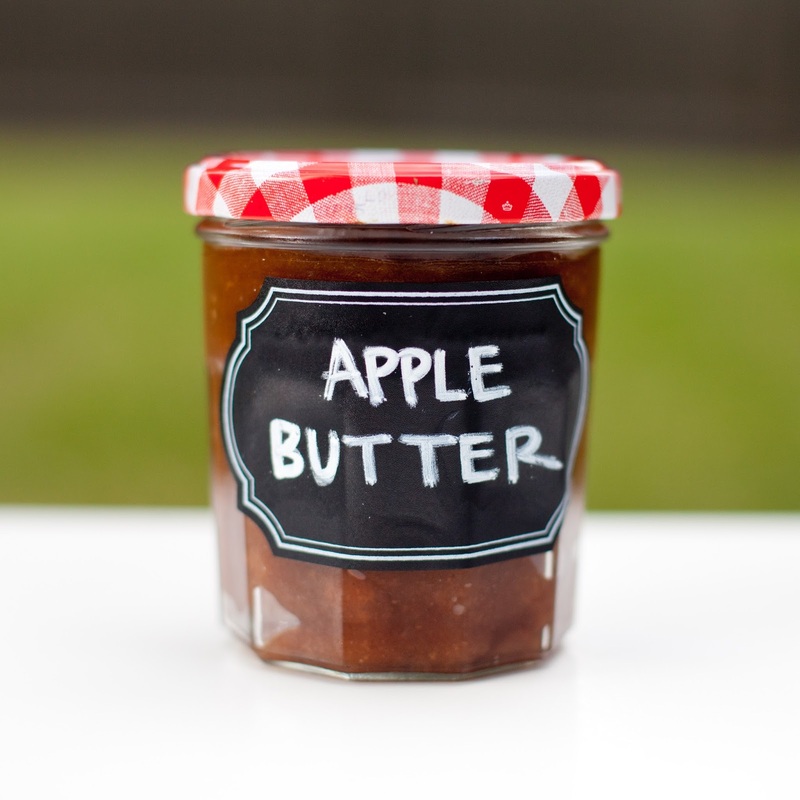 We've actually had a bit of an overabundance, so I decided to try my hand at something I've never made - apple butter. 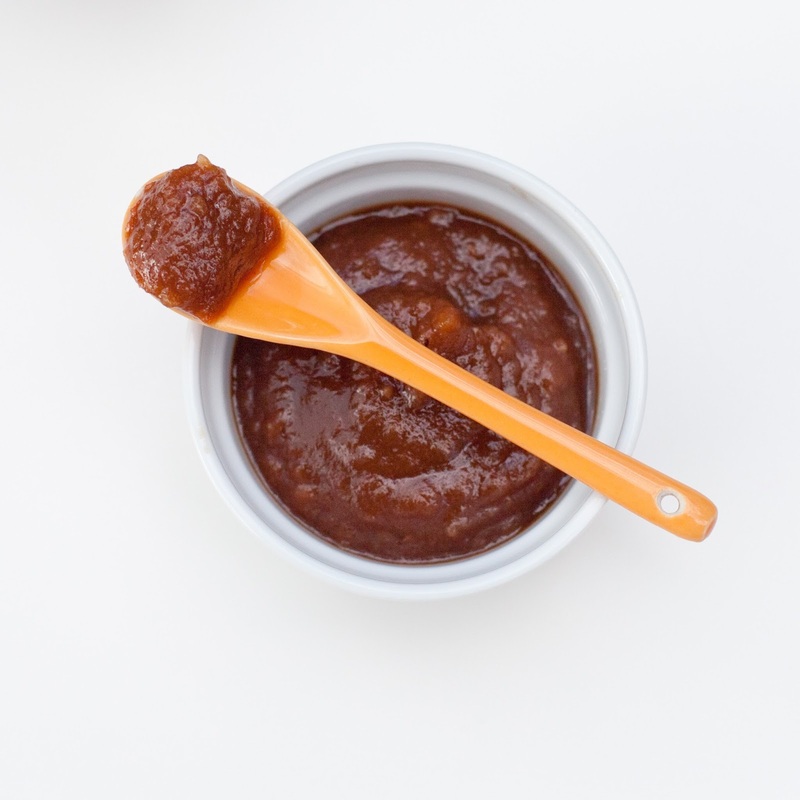 Have you tasted apple butter? 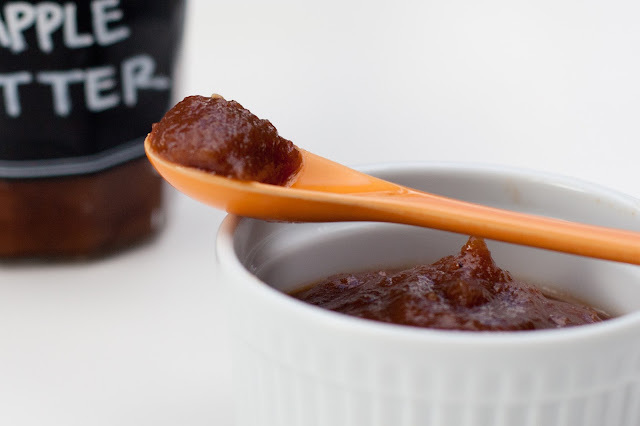 It's a sweet, concentrated form of applesauce that you can use in place of jam or jelly. I scoured Pinterest and found lots of different crockpot apple butter recipes. Score. You know I'm in love with my slow cooker. The recipes were all pretty different, so I basically went through and picked the ingredients I liked working with best. Next, I just made a guesstimate to the amount of apples needed. The recipes all called for different amounts: "seven pounds" or "three pounds" or "a dozen"... I didn't have a scale at home anyway, so I just peeled, cored and diced the apples until they filled the crockpot three-quarters of the way up (I probably ended up using 10-12 large apples). My mom has one of those fancy mechanical apple peelers that you hand crank, but I just use a regular serrated peeler (the serrated part makes all the difference) and an apple corer. The coring, peeling and dicing can get a bit tedious and time consuming, but once that part is done, seriously, the hard part is over. Just toss the apples in the slow cooker and add the rest of the ingredients directly in. Give it a good stir, then cook on low for a good 10+ hours. Yep. Ten. I actually left mine in for eleven, but all crockpots are different (and I actually cooked mine overnight while we were sleeping! Waking up to a kitchen that smells like apple pie? The best!). You want to keep the apples cooking until their sugars caramelize and they turn a deep brown color. They will be super, super soft and very easily mash-able. For the best consistency, though, pull out your immersion blender and blend them up right in the crock poet (I let mine cool a bit first). If you don't have an immersion blender, let the mixture cool and blend up in batches in a food processor. 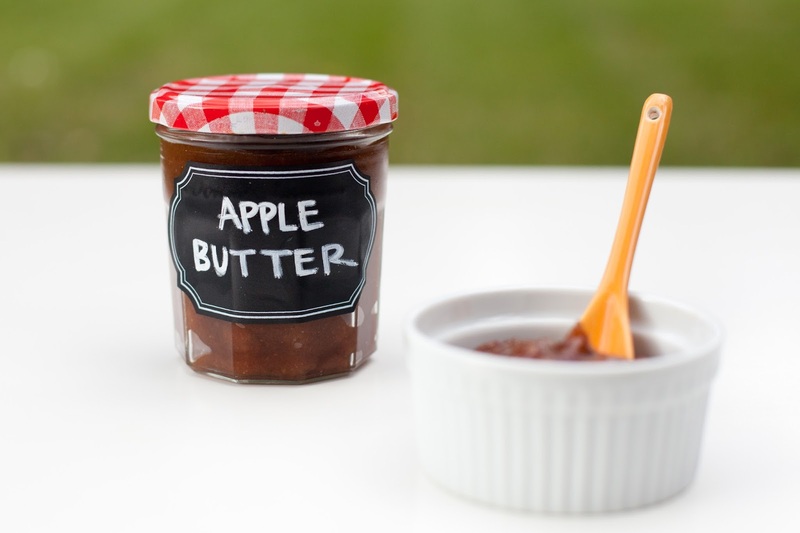 To store, put the apple butter in glass jars and refrigerate. It will be good up to two weeks. The end product is ah-mazing. It's like eating autumn. I said before that apple butter can be subbed in anytime you'd use a jam or jelly - so pull it out to top toast, english muffins, oatmeal, waffles... or my new favorite breakfast, plain greek yogurt with granola and apple butter. Ohmyword, I could eat a whole vat of this stuff. I think it would also be fabulous warmed up on top of vanilla ice cream. Core, peel and dice (large pieces are fine) the apples (you want to fill your slow cooker about 3/4 full). Pour in sugars, cinnamon, ground cloves, salt and nutmeg and stir to mix. Cook on low 10+ hours until apples are a deep brown color. Cool and use an immersion blender until desired consistency. Pack in small glass jars and refrigerate up to two weeks. Make best friends with your neighbors by giving a couple jars away. Oh my this sounds delicious. Does it matter what kind of apples you use? I'll let you know! I have a batch cooking with yellow CSA apples right now. The first batch was with the reddish ones. I guess that kind of answers the question since I don't even know the actual type I'm using, ha!